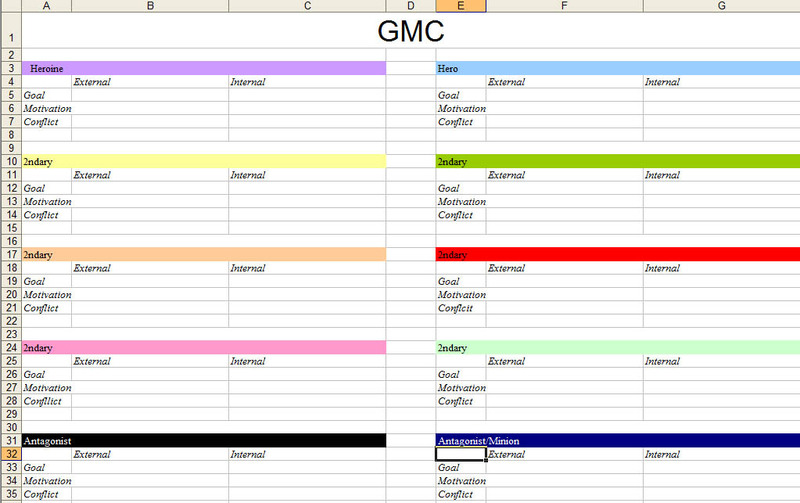 Get Your Very Own GMC Spreadsheet! Working on a new story that I’m really excited about. Written down my backstory, written where my characters are immediately before the story starts. Now I’m working on the GMC charts* for my two protags, my secondary characters, and my one (maybe two?) antagonists. Once I have this, it will be awesome and make the story better to the nth degree. But, how much do I hate doing these? I always have to get the book out and go over the parts I highlighted (thankful for that foresight, go me) and make sure I have concrete, measurable external goals and then the internal part which should be easier but somehow isn’t. Then, I think, I’m going to write little autobiographies in character voice. And this, friends, is why I need a novel notebook. Let me know about your process–comment! *The file above is an MS Excel Spreadsheet template. A screencap is included to the left, click to enlarge. It was virus free when it left my computer, but because I don’t want any mean emails, etc., you are downloading at your own risk, I make no guarantees as to how it will affect your computer. Usual rules apply. Use it all you want, but don’t share it. Just link back here. Thanks! Previous Post: Best. Character. Name. Finder. Ever.